Provides NRR 21 dB, while allowing face-to-face speech communication and situational awareness in most light to medium noise situations. Suggested Uses: Industry, Construction, Motorsports, Aircraft, Music, Musicians, Travel and Personal Use. 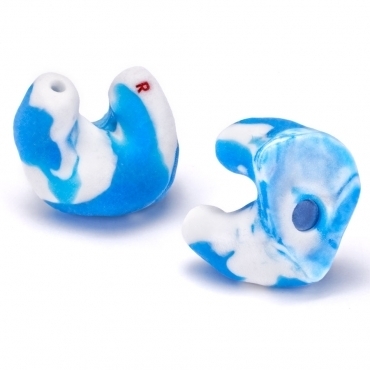 Detachable cord allows selectable protection between NRR 21 dB and a higher NRR 28 dB. Great for industrial environments with a wide-ranging amount of noise exposure. Suggested Uses: Industry, Construction, Shooting, Motorsports, Aircraft, Emergency Vehicles, Travel and Personal Use. The Maximum NRR available in the DefendEar line for high-noise industrial environments. Suggested Uses: Industry, Construction, Shooting, Motorsports, Aircraft, Emergency Vehicles, and Personal Use. 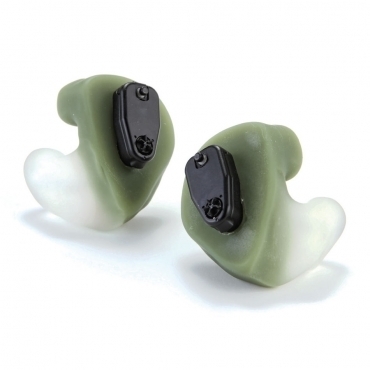 DefendEar Digital custom hearing protection from Westone is the most advanced way to prevent hearing loss from gunshot noise while enhancing ambient sounds for increased situational awareness. 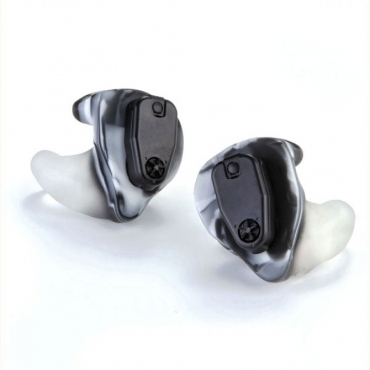 All DefendEar Digital models suppress high-level impulse sounds while enhancing low-level speech that is difficult or impossible to hear with traditional passive hearing protection. The Digital 1 provides excellent all-around noise suppression and ambient amplification for a variety of shooting environments. The Digital 2 offers two modes for either intermittent or continuous shots in addition to ambient sound enhancement. The Hunter boosts low-level sounds for detecting game movement while providing impulse suppression tailored for continuous shots from larger caliber firearms. The Hunter has a second mode that reduces wind noise typical in the open range and in hunting stands. 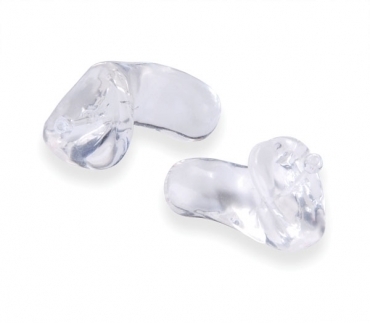 The DefendEar modules are incorporated into Westone maximum attenuating OtoBlast™ silicone hearing protectors for the best comfort, fit, and protection available. Made specifically for shooting sports and high impact noise situations. Exceptionally accurate and lightning fast, DefendEar Digital active, digital circuitry delivers unsurpassed amplification for situational awareness and appropriate noise suppression when you pull the trigger. Modular Design = field-removable electronics that allows for easy cleaning, service repairs, or future upgrades. Also made specifically for shooting sports and high impact noise situations. Enhanced DefendEar Digital active processing, digital processing delivers superior amplification for situational awareness and advanced noise attenuation when you pull the trigger. DefendEar's top of the line custom digital processor. Made specifically for shooting sports and high impact noise situations. The DefendEar Hunter has all the features as Digital 2, but also includes increased noise suppression for large caliber firearms, and the selectable 'severe conditions mode' offers a higher level of wind noise reduction. AquaNots prevent moisture from entering the ear canal. They are optimal for swimming, watersports, and showering to prevent infection. AquaNots float and feature added finger grips for easy removal. Not intended as protection from noise. AquaNot Options/Accessories: Colors, Swyrl (up to three mixed colors), Initials, Slick-Sil® (anti-microbial coating), Cords. 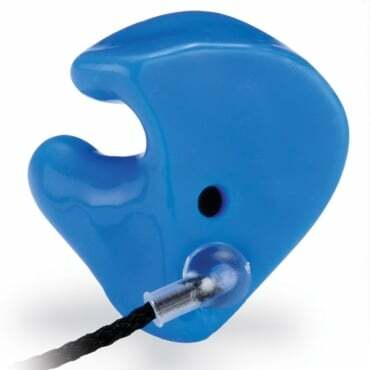 The Surfer is designed to prevent surfer’s ear and swimmer’s ear caused by exposure to cold water and wind. The floatable material is molded with a sealed membrane spanning the sound bore that keeps cold water and air out of the ear canal but allows for conversation and hearing while in the ear. Not intended as protection from noise. Suggested Uses: Surfing, Swimming, Skiing, Snowboarding, Jogging, etc. Options/Accessories: AquaNot Colors, Swyrl (up to three mixed colors), Initials, Slick-Sil® (anti-microbial coating), Cords. The Motorsport is designed with a hollow canal for under helmet use to reduce wind buffeting. It is comfortable and easy to remove. Check local laws governing use. Not intended as protection from noise. Options/Accessories: Colors, Swyrl (up to three mixed colors), Cat-Eye, DisappEar, Glitter, Initials, Slick-Sil® (anti-microbial coating). 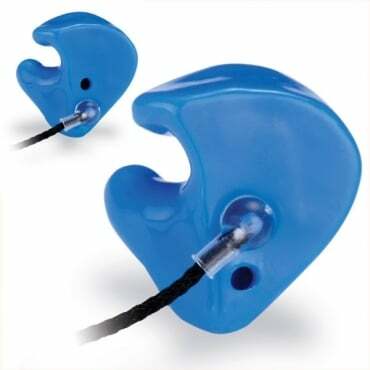 The Concert is an ideal hearing protector for musicians and concert attendees, but is also useful to anyone who needs to hear accurately in high-noise environments. An interchangeable flat attenuation filter allows the wearer to hear sounds accurately, but at reduced volumes. Can be ordered with a choice of 9, 15, or 25 dB Etymotic Research® filters. Attenuation: 9 dB ER-9 filter, 15 dB ER-15 filter, 25 dB ER-25 filter, solid adapter (not rated). Suggested Uses: Concerts, Performance, Audio Engineers, DJ-ing, Music Teaching, Bartending, Subways, Dental Work, Movies, etc. Options/Accessories: Colors, Swyrl (up to three mixed colors), Cat-Eye, DisappEar, Glitter, ER-9, ER-15, ER-25 Filters and Solid Adapters, Initials, Slick-Sil® (anti-microbial coating). The Sleep is designed to promote comfortable and uninterrupted rest. It is great for shift workers and credited with saving many relationships! Attenuation: NRR 24-27 dB, average attenuation 37-39 dB depending on material. Suggested Uses: Sleeping on ships, airplanes, and other loud noise environments. The Hunter Passive is for hunting environments where a low number of shots are fired. It utilizes small orifice non-linear acoustic filters, and a low NRR of 4 allows for awareness of game and tracking dog sounds, as well as easier communication with hunting/shooting partners. For other impulsive noise environments with impulses below 160 dB peak SPL for adults, employing filters utilizing small orifice non-linear acoustics. Options/Accessories: Colors, Swyrl (up to three mixed colors), Laser Engraved Initials, Handle or Cord. 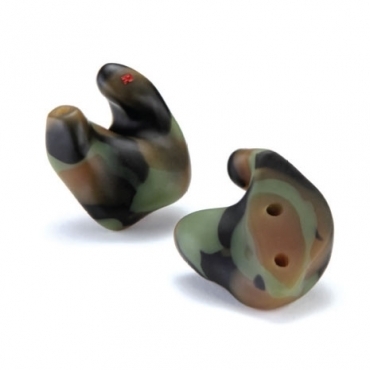 The Solid offers the maximum amount of hearing protection available in the DefendEar Recreational line and is optimal for high-noise environments. Also available in modified styles. Attenuation: NRR 24-29 dB, average attenuation 37-40 dB depending on material. Suggested Uses: Shooting Guns, Machine Operations, Lawn Mowing, High Noise Activities, etc. Options/Accessories: Colors, Swyrl (up to three mixed colors), Cat-Eye, DisappEar, Glitter, Eyelets, Cords, Removal Handles, Initials, Slick-Sil® (anti-microbial coating). Upgrade virtually any stock earphone with iCustom earpieces. 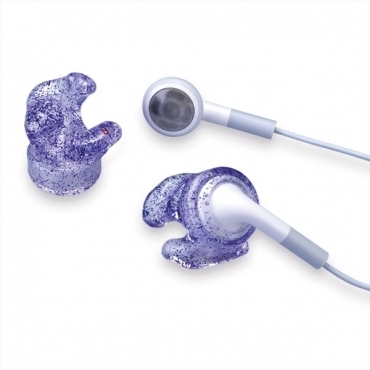 iCustoms easily couple with iPod® earbuds (and most other brands) to reduce distracting external noise for better sound. 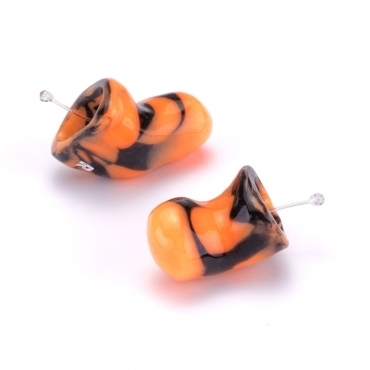 The custom fit also assures iCustoms stay securely in the ear when walking, jogging, or riding. Options/Accessories: Colors, Swyrl (up to three mixed colors), Cat-Eye, Glitter, DisappEar, Initials, Slick-Sil® (anti-microbial coating). 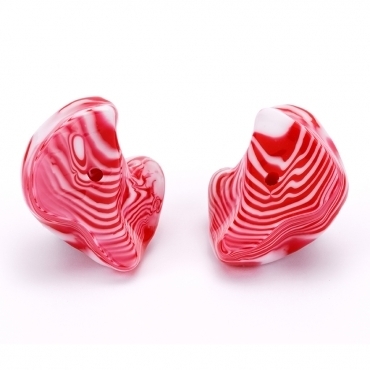 This half-shell earpiece provides a moderate amount of hearing protection that is easy to insert/remove. The filtered design allows for face-to-face verbal communication in light to moderate noise situations. Also available in modified styles. Attenuation: NRR 18-21 dB, average attenuation 30-32 dB depending on material. Suggested Uses: For moderately loud noise environments in which you need to be able to hear clearly. Options/Accessories: Colors, Swyrl (up to three mixed colors), Cat-Eye, DisappEar, Glitter, Initials, Cords, Handles, Slick-Sil® (anti-microbial coating). 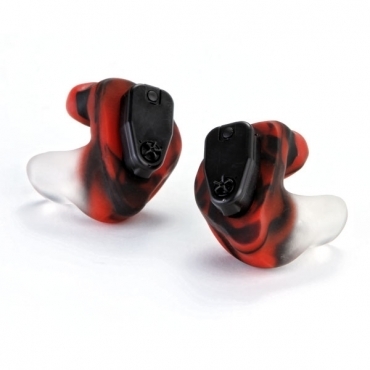 Thick, full-shell hearing protection earpiece with filtered attenuator. Attenuation: NRR 10 dB, average attenuation 20 dB. Options/Accessories: Colors, Swyrl (up to three mixed colors), DisappEar Glitter, Eyelets, Cords, Handles, Initials, Slick-Sil® (anti-microbial coating). Of course, hunting with firearms, whether with a rifle, shotgun, muzzleloader, or even a handgun, necessitates both a great deal of safety and practice. In order to be a good shot, as well as being safe with firearms, requires shooting a lot of rounds. And let’s face it, guns are extremely loud! Hearing protection should always be worn when practice shooting. The problem for hunters is that our ears are probably the most important sense we use when hunting. Every twig-snap, leaf rustling, and sound become so enhanced while hunting. Your eyes follow what you hear. So, wearing hearing protection while hunting is usually not done. Like many others, because of all of the shooting and hunting I did in my younger days, I too started wearing hearing aids a few years ago due to my noised induced high-frequency hearing loss. 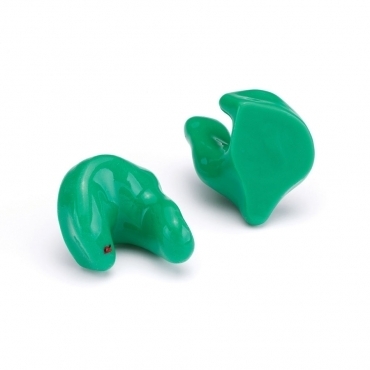 There are amazing systems that have been out for a while, like Walker’s Game Ear®, which allow you to use your ears while hunting, or even practice shooting, but also offers hearing protection at the same time. I wore these for years. 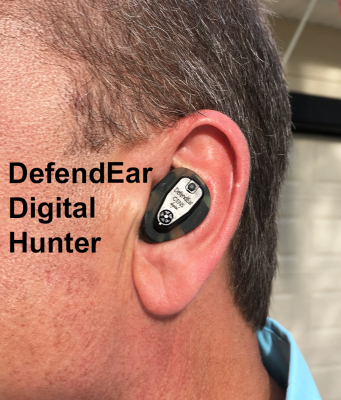 The newer custom digital devices like I'm wearing in the photo to the right, Westone’s DefendEar Digital Hunter®, are the most advanced in the world. I’m able to turn the volume up to hear the woods come alive even better, but as soon as I pull the trigger the Noise-Suppression-System cuts off the blast in milliseconds. 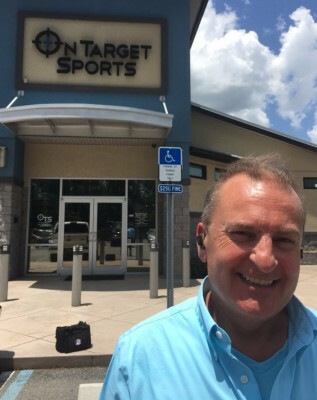 I still practice shooting a couple of times a week at, On Target Sports, LLC , the range where I’m a member, and wear them every time I go. 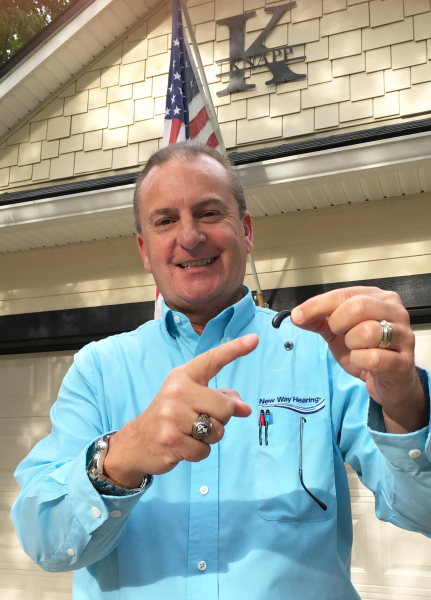 ​​My new Unitron Hearing Aids that I'm pointing to in the photo to the left actually do the same thing. They have a system called, Antishock2®, which is designed to block any excessive loud noise from entering my ears. Most folks don’t realize that today’s modern digital hearing aids also protect their hearing. The bottom line is, protect what hearing you have. Whether at work, play, or recreation, it’s just not wise to take your hearing for granted. 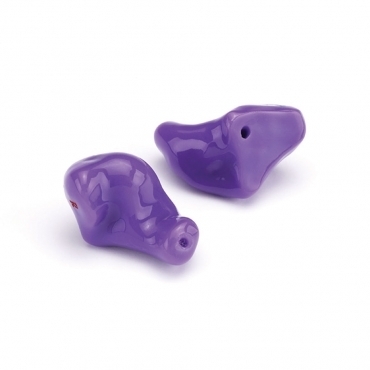 New Way Hearing® offers a wide selection of Custom Hearing Protection Products for all kinds of activities. Even if you're working with power tools, running heavy equipment, playing in a band, riding a Hog, surfing, or just mowing your yard, we have everything you'd need. The neat thing is, once you get one of our Custom Hearing Protection Products you’ll have them for life, unlike the foam inserts that constantly get thrown away. Please feel free to contact me if you have any questions.